New musical styles don’t surface too often, most of the time artists are happy to dwell on a genre invented by somebody else. In the early Nineties, Swedish band Bathory all of a sudden turned its back to black metal and invented Viking metal with the album Hammerheart, and finetuned this new kind of metal with their following record Twilight Of The Gods. Since then, a lot of bands have dabbled in the Viking metal territory, sometimes adding new nuances, or mixing it with other styles. Ereb Altor apparently started in the year when Hammerheart came out, but it took them until 2003 for their first demo to appear. The debut album By Honour followed in 2008, to be succeeded by The End two years later. The two members Crister Olsson (also playing guitar in Isole) and Daniel Bryntse (active in too many bands to mention) faithfully re-enact the sound that Bathory did on their two classic albums and don’t even try to add something of their own. The guitar sound is the same, and the shared vocals have much in common with the late Quorthon’s quavering singing style. Apart from the four minute intro that works as an instrumental setting the mood for what is to follow, the songs are all between six and twelve minutes. The title track even consists of the last three songs, making it to an epic encompassing half of the CD’s playing time. The Swedish duo has certainly learnt its lessons, and more than once you might believe being in the presence of a long lost Bathory album, and as tributes to this outstanding band are not as frequent as, let’s say, to AC/DC or Metallica, it’s not even a bad thing. But it also has to be said that the production is not able to conjure the same majestic atmosphere as we know from the mighty forefathers of Viking metal. The End works as a tribute, has some good songs, like Myrding, but especially the title track too often seems to borrow too directly from the source material. Bathory fans shouldn’t mind, considering that Quorthon is no longer around to record new albums and anyway, much of his repertoire consisted also of black metal and – during his solo career – grunge! 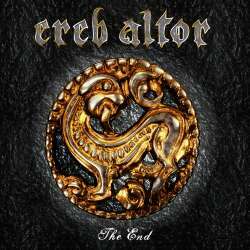 Apparently The End is supposed to be Ereb Altor’s last album, and to be perfectly honest, that makes sense, because it’s artistically more satisfying to try new ways than to remain in a state of perpetual homage.